The Communication Block wine project fulfilled the desire for Lampyridae Vineyards produce stunning wines and support the education of children who need technology to communicate. Our commitment supports the Napa Valley Kids Connect program which promotes academic achievement for children who have severe communication needs. 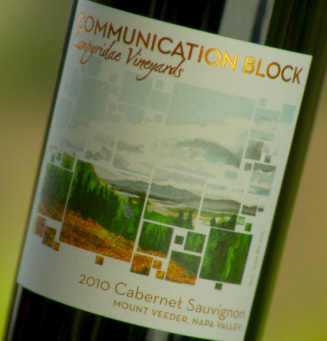 Acclaimed winemaker Aaron Pott has donated his talents in producing the Lampyridae Vineyards Communication Block wines. Aaron and his wife Claire have a personal familiarity with Mt Veeder grapes, as they are vintners and growers in this appellation. Along with Pott Wine, Aaron consults with a number of notable producers including Quixote Winery, Seven Stones, Blackbird Vineyards, Fisher Vineyards, among others. Amongst his accolades, he was named in Food and Wine magazine's winemaker of the year. Finally, this wine project is such a success with the support of Quixote Winery and Monticello Vineyards. Both wineries have donated their facilities as well as bottling time to allow us to make the most money possible for the children benefiting from Napa Valley Kids Connect. Many, many thanks to all of those involved.